As state and federal agencies investigate GenX in groundwater, Carolina Journal has learned GenX and its family of unregulated emerging contaminants are present in some of the solar panels increasingly dotting North Carolina’s landscape. Chemical manufacturer Chemours makes GenX at its Fayetteville Works plant. The state and others have sued the company for releasing the chemical into the Cape Fear River, contaminating drinking supplies. Mark J. Strynar, an EPA scientist whose research helped to identify Chemours’ GenX pollution, has said the EPA compiled 39 records showing PFAS related to solar panel components. Chemours uses GenX to make Teflon. Its marketing materials say Teflon film is used as the front coating in many solar panels. Politicians and activist groups are demanding answers — and action against the company. Sens. Michael Lee, R-New Hanover; Bill Rabon, R-Brunswick; and Wesley Meredith, R-Cumberland, filed Senate Bill 724 ordering Chemours to be shut down if it didn’t stop releasing GenX. Reps. Ted Davis, R-New Hanover; Holly Grange, R-New Hanover; Frank Iler, R-Brunswick; and William Brisson, R-Bladen, filed an identical House Bill 972. CJ asked all the lawmakers if they had any concerns about the possible presence of GenX in solar panels. Only Lee responded. “I have heard that GenX is in solar panels, but never anything confirming it,” Lee said. He referred to a Fortune magazine article about GenX used in many consumer and commercial purposes. During debate on the House override of Gov. Roy Cooper’s budget bill veto, Rep. Deb Butler, D-New Hanover, said budget writers didn’t spend enough to address GenX concerns. “We seem to want to put the blinders on instead of addressing this in a comprehensive fashion,” Butler said from the House floor. Republican U.S. Rep. Richard Hudson, whose 8th Congressional District includes areas affected by GenX, is concerned about potential contamination from GenX in solar panels. “[Hudson] takes it very seriously, including any potential GenX contamination,” said Hudson spokeswoman Tatum Gibson. Hudson directly questioned former EPA Administrator Scott Pruitt about the issue, Gibson said. CJ asked DuPont which solar companies used Teflon film and how many solar panels in North Carolina might contain GenX. “This product line has been divested and is now part of the Chemours Company,” a DuPont statement said, directing queries to Chemours. Chemours has not responded to numerous requests for an interview or answered questions about GenX in solar panels. It did forward a copy of a June 11 status report submitted to the court as part of the state’s lawsuit over discharges at the plant. Utility companies built and operate numerous solar energy plants, and purchase solar power from many more. “We do not have the GenX product on any of the panel materials at our sites,” said Bonita Billingsley Harris, a Dominion Energy spokeswoman. “This is an emerging discussion Duke Energy is following. We will monitor any guidance given by the Department of Environmental Quality or the EPA,” said Randy Wheeless, a Duke Energy spokesman, neither confirming nor denying solar panels at Duke facilities have components containing GenX. David Drooz, chief counsel of the N.C. Utilities Commission Public Staff, said it doesn’t have information on the chemical composition of solar panels. “Environmental and health scientists — who are not part of the personnel at the Public Staff — would have to determine if GenX and similar chemicals are an unreasonable environmental or health hazard,” Drooz said. “The amount of GenX in the Cape Fear River, and the risk of it in intakes for drinking water supplies, may be a very different risk from that in solar panels. That is a scientific question outside the scope and capability of the Public Staff,” Drooz said. 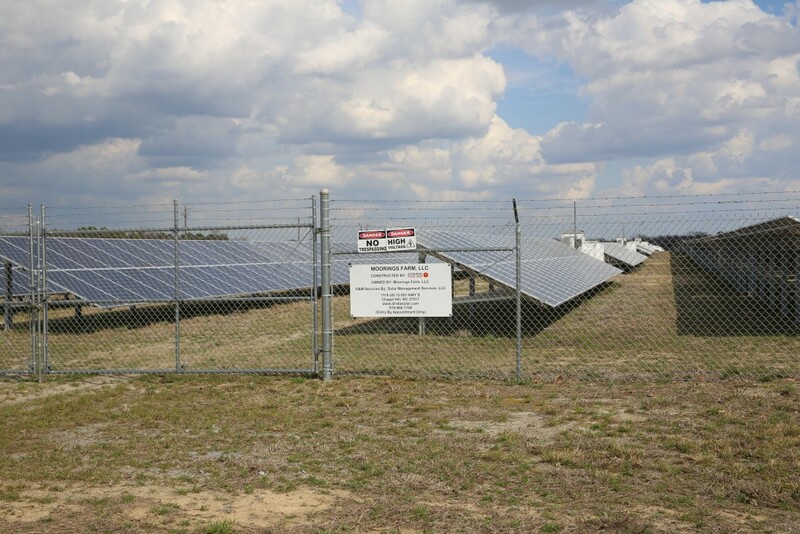 Neighbors opposing the industrial-scale Wilkinson Solar Plant in Beaufort County have raised fears in state Utilities Commission proceedings that GenX could be in solar panels. The Utilities Commission doesn’t track locations or numbers of solar panels containing GenX . The state Department of Environmental Quality hasn’t given CJ answers about any GenX research related to the compound’s use in solar panels. Nor has DEQ responded to a May 24 public records request seeking departmental communications involving GenX in solar panels. Alan Ducatman, who teaches environmental health sciences at West Virginia University’s School of Public Health, has studied the health effects of GenX. He has noted studies show GenX displays biological effects like the C8 compound it replaced in Teflon production. Chemours and DuPont in 2017 settled lawsuits from more than 3,500 claimants for $670.7 million Production of Teflon using C8 at Chemours’ Parkersburg, West Virginia, factory was linked to kidney and testicular cancer, thyroid disease, hypertension, and other health problems. Ducatman told CJ chemists are best suited to answer whether GenX in solar panels poses a health risk. “[It] may depend on the durability of the film coating, and especially on the nature of the product,” Ducatman said. Cobey Culton, a state Department of Health and Human Services spokesman, said GenX and related compounds are used in a wide variety of consumer products that could be a source of human exposure. In late May the EPA announced it is collaborating with federal and state partners to develop toxicity values for GenX. None exist. North Carolina has set a safe limit of 140 parts per trillion in drinking water. Chemours and its predecessor DuPont have been under a consent order since 2009 to conduct health and environmental testing on GenX. “EPA reviewed these data as they were submitted to EPA. Testing of solar panels which may contain fluoropolymers that were potentially created using the GenX chemicals was not part of the testing included in EPA’s consent order,” the EPA told CJ. The EPA’s GenX research to develop PFAS toxicity testing will apply across industries, the statement said. EPA scientists are “developing and validating laboratory methods to detect and quantify selected PFAS — including GenX chemicals — in water and soil,” the statement said, including how the chemicals might migrate into soil and water.